Ohaus Ranger Count 3000 Scale 60 lbOhaus Ranger Count 3000 replaces the EC30 and are economical and designed for fast, accurate operation. This item is ideally suited for annual inventories, parts rooms, rentals and other counting applications Capacity: 60 x 0.002 lbs. 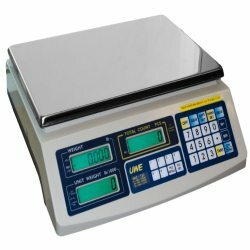 Ohaus Ranger Count 3000 Portable Scale 30 lb.Ohaus Ranger Count 3000 replaces the EC15 Series Counting Scales with 30 pound max capacity are economical and designed for fast, accurate operation. Ideally suited for annual inventories, parts rooms, rentals and other counting applications. 30 x 0.001 lbs. Cardinal C100 Portable Counting Scale 100 lbThe Cardinal C series portable counting scale is available in 100 pound capacity and feature a rechargeable battery pack standard for mobile weighing, up to 99 stored product look ups (9 direct quick keys), sturdy stainless steel platform, piece counts with known and unknown weight samples, backlit blue LCD. 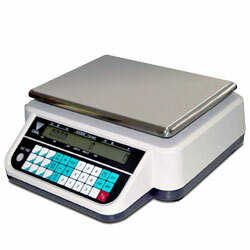 The C100 counting scales are ideal for inventory counting where mobility is a must! Cardinal C30 Industrial Counting Scale 30 lb.The Cardinal C series portable counting scale is available in 30 pound capacity and features a rechargeable battery pack standard for mobile weighing, up to 99 stored product look ups (9 direct quick keys), sturdy stainless steel platform, piece counts with known and unknown weight samples, backlit blue LCD. 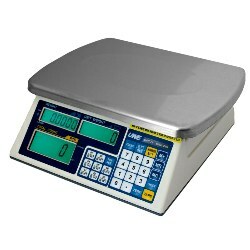 The C30 counting scales are ideal for inventory counting where mobility is a must! 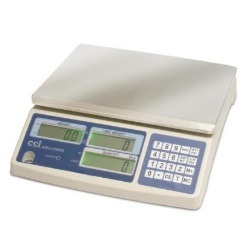 Adam Equipment CBC100a Counting ScaleThe Adam Equipment CBC100a counting scales are some of the best value counting scales you're going to find. Features include: Modern low profile design, Anti-tilt bumpers and non-slip feet for stability, 3 Large easy to read backlit LCD displays, Programmable for counting to a pre-set number of parts, Overload and underload protection, Easy to use keypad, Memory accumulation and Internal rechargeable battery with approximately 70 hours of operation / external power adapter (adapter supplied as standard). 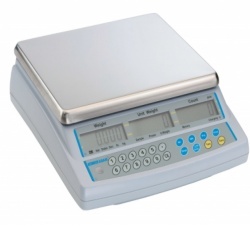 Adam Equipment CBC70a Counting ScaleThe Adam Equipment CBC70a counting scales are some of the best value counting scales you're going to find. Features include: Modern low profile design, Anti-tilt bumpers and non-slip feet for stability, 3 Large easy to read backlit LCD displays, Programmable for counting to a pre-set number of parts, Overload and underload protection, Easy to use keypad, Memory accumulation and Internal rechargeable battery with approximately 70 hours of operation / external power adapter (adapter supplied as standard). 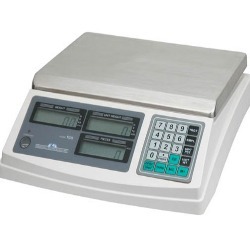 Transcell TCS3T-60 lb Counting ScaleThe TRANSCELL TCS3T-60 lb Counting Scale is built with precision workmanship and high quality components. It represents a new and practical approach to controlling counting accuracy. Digi DC-782 Portable Counting Scale 6 lbDC-782 counting scale from Digi features 6 lb max capacity and has the perfect blend of ruggedness for industrial environments and portability for operator convenience - all at a great price. The DC782 offers an optional rechargeable battery with life of approx 300 hours. Digi DC-782 Portable Counting Scale 30 lbThe DC-782 parts counting scale with 30 pound max capacity displays the perfect blend of ruggedness for industrial environments and portability for operator convenience. At a great price. The DC782 offers an optional Rechargeable Battery with battery life of 300 hours. 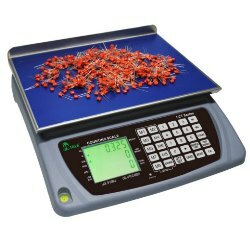 Digi DC-788 Counting Scale 100 lb.The DIGI DC-788 exceeds all expectations of a counting scale at a price that can’t be beat! With a capacity of up to 100 pounds, and an optional rechargeable battery that provides up to 24 hours of continuous usage, this durable counting scale offers tremendous power and virtually unlimited flexibility. Its bright red LCD display can be seen from any angle and is highly visible in low light areas. 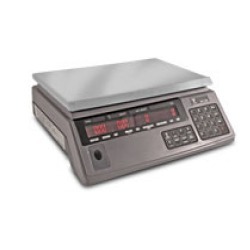 Digi DC-788 Counting Scale 20 lb.DIGI DC-788 parts counting scale exceeds all expectations of a counting scale at a price point that can’t be beat! With a capacity of up to 20 pounds, and an optional rechargeable battery that provides up to 24 hours of continuous usage, this durable counting scale offers tremendous power and virtually unlimited flexibility. Its bright red LCD display can be seen from any angle and is highly visible in low light areas. Counting Scale 4x4 Industrial Floor Scale 5000 lbCounting Scale that is connected to a 4x4 industrial floor scale. You place your items on the counting scale to obtain a sample and then use the same average piece weight on the large floor scale. Cap: 5000 lb. Price includes freight in cont'l US to business addresses only (Zoned Commercial) with a loading dock or forklift. The items you are counting must be uniform in weight. 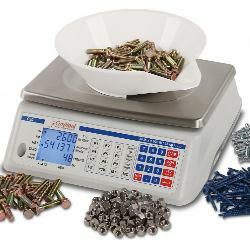 No counting scale will ever function with any high degree of accuracy if there is a significant variation in the weight of the items. 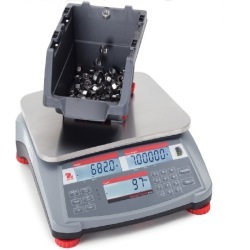 The larger the initial sample (30 pieces versus 5 pieces) the better results the counting scale can provide since it averages out any variations in the piece weights for accuracy. Also, please don't buy a parts counter with too large of a maximum capacity. A large portion of customers buy a counting scale with more maximum capacity than they typically will be needing. The reason is usually along the lines of needing to weigh small items and a few larger items. If the majority of the time you're counting no more than ten pounds of parts at a time, then a 10 lb. 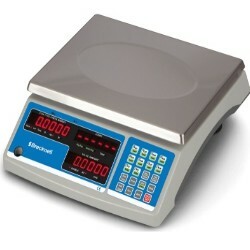 capacity counting scale is a great choice for you. 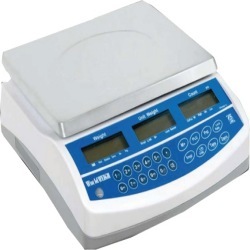 If you need larger capacity options, you can choose buy a couple of different capacities, or buy a scale with accumulation function, or buy a model with remote scale capability like the GSE 675.